Prototyping a new recycling sorting guide at a coffee shop. I’m Céline. 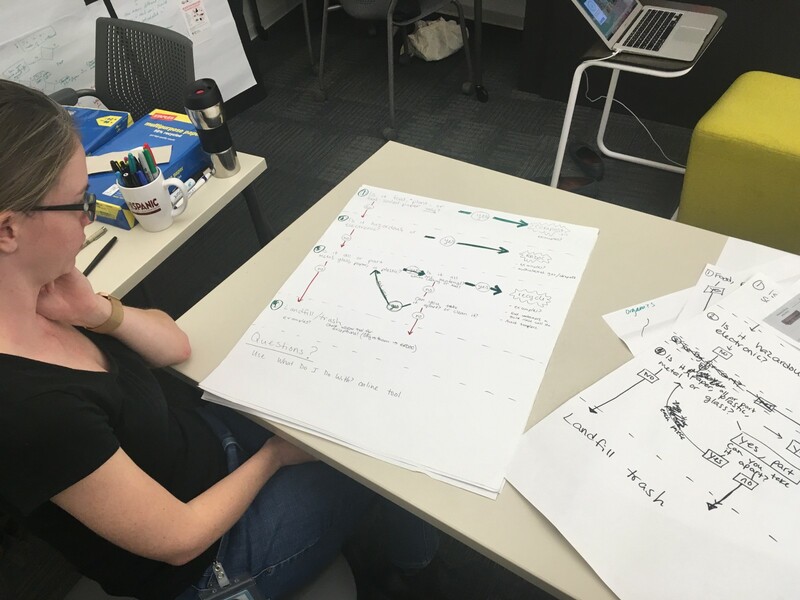 I’m a Design, Technology, and Innovation Fellow for the City of Austin, using human-centered research and design, rapid prototyping and field testing to positively impact city services. I’m on my second project with the City of Austin. I introduced the project here. In this post, I‘ll introduce our design methods and first prototypes. Want to learn more about the fellowship? You can find information here. 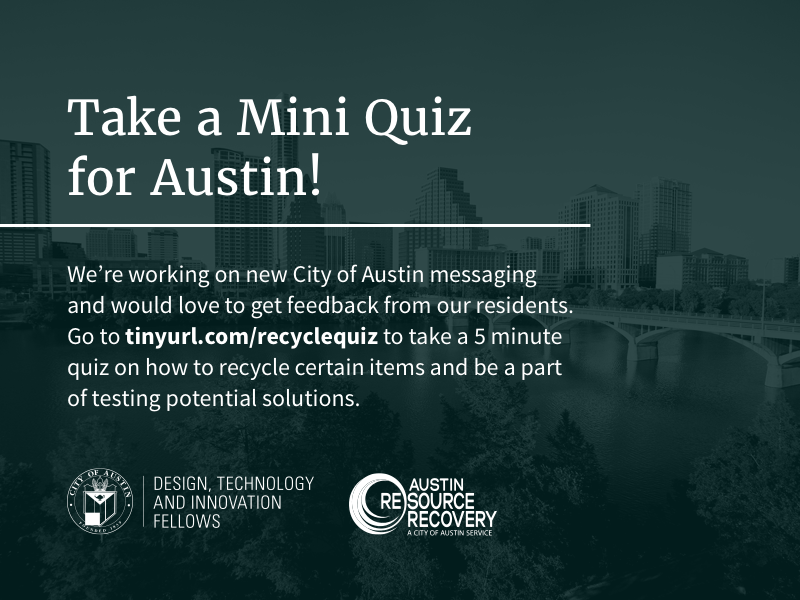 Austin Resource Recovery partnered with the City’s Design, Technology, & Innovation Fellows program in September to unpack why Austin residents struggle to recycle. The city has its sights set on becoming zero waste by 2040, or in other words, keeping 90% of trash out of the landfill. How can residents achieve that? Donate, compost, or recycle everything they can before even considering the trash can. Currently the city is behind goal, stagnating at 42% diversion. 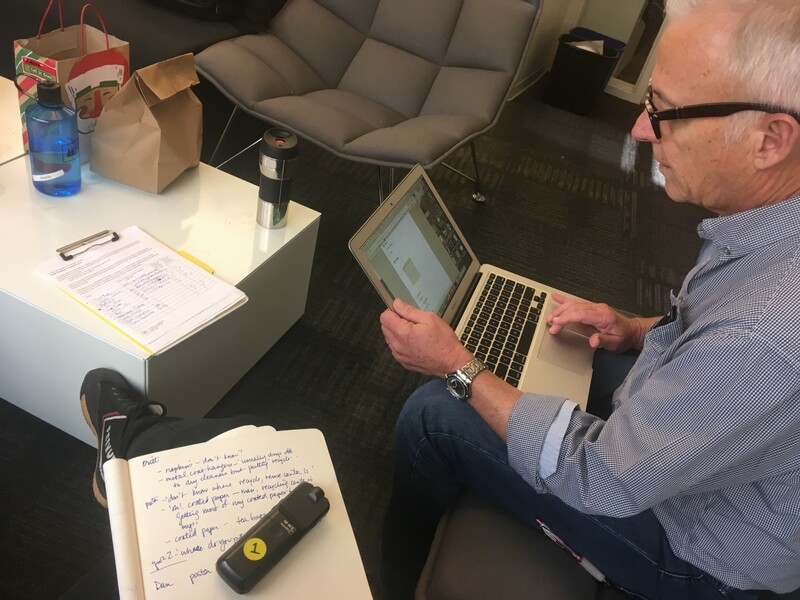 Our goal is to bridge the gap and develop better tools & messaging for residents with human-centered research & design, rapid prototyping, and field testing. and mapped a prototyping schedule including eight ideas to test. 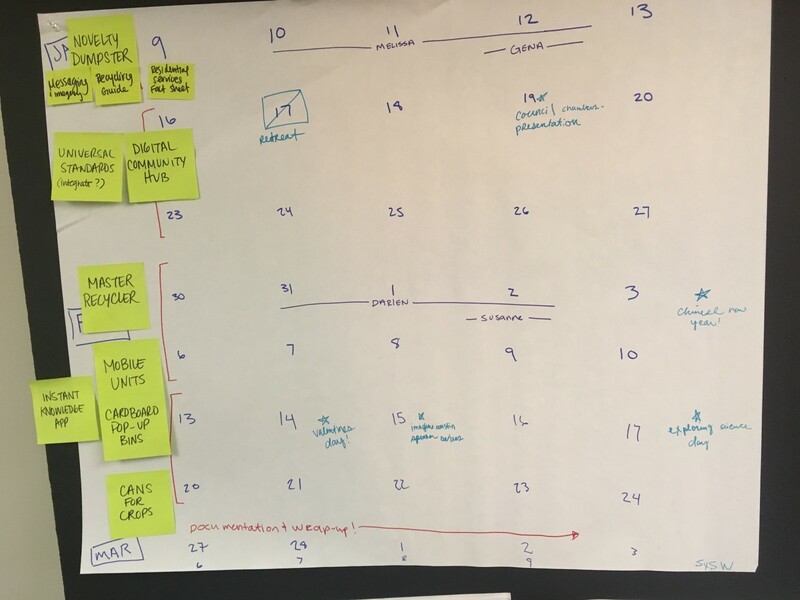 Our eight prototypes on a scrappy sprint schedule. Rapid prototyping is a low-cost and effective method for testing the potential of a new service, product, or message. Read about how the first Blackberry phone was prototyped using a wooden block. It’s easy to do. Here’s the steps. and test it with the people you’re designing for, in the context they’ll use it. Returning over and over again to the people who’ll need to use the product or service will reveal what actually works. A common alternative is having a four hour discussion with a room full of executives on what someone assumes people do or don’t want; the result being a wide-scale, expensive implementation of someone’s assumption that falls flat on its face because people can’t or don’t want to use it. Our prototyping started January 4th with two ideas. Knowledge Messaging: new messaging that boosts resident knowledge of recycling rules and systems. Novelty Bin: an interactive, public recycling bin that delivers positive or negative feedback. We planned the prototypes using a whiteboard then our team broke out into two groups to build & test each prototype. All our work had to be completed in one weeks time, including documenting and sharing findings with our partners. and “Thanks for keeping Austin clean,” appealing to environmental motivation. discovered that the recordings didn’t all include the word “recycling” so passersby that did hear it didn’t have any reference for where the sound was coming from. ultimately, the audio & visual cues combined did capture people’s attention. Our team decided to keep the Novelty Bin in the prototype mix, used the test observations to determine design changes, and planned the next round of prototyping. Group 2 designed two versions of a new Austin compost, recycling, and trash sorting guide. 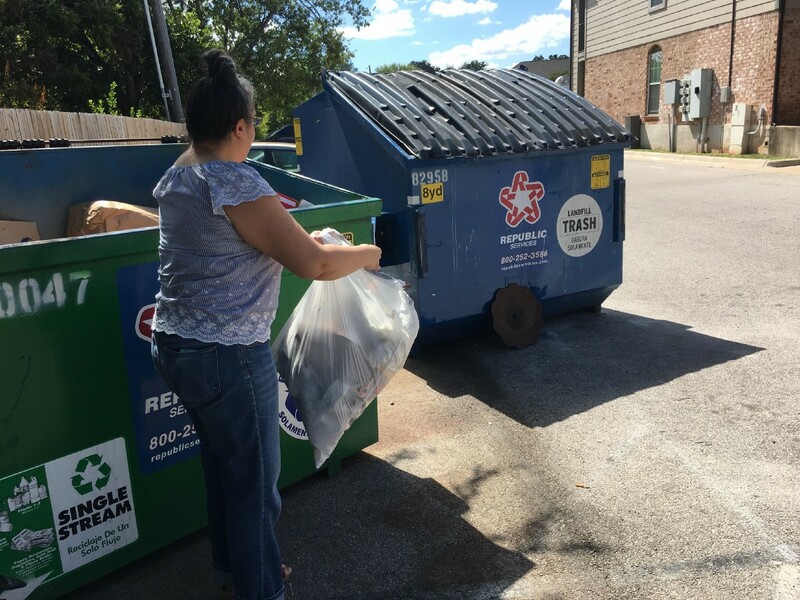 We know from research that even our best Austin recyclers struggle to do it 100% correctly. There’s an ever-expanding set of rules and confusing exceptions because packaging has gotten so complicated. 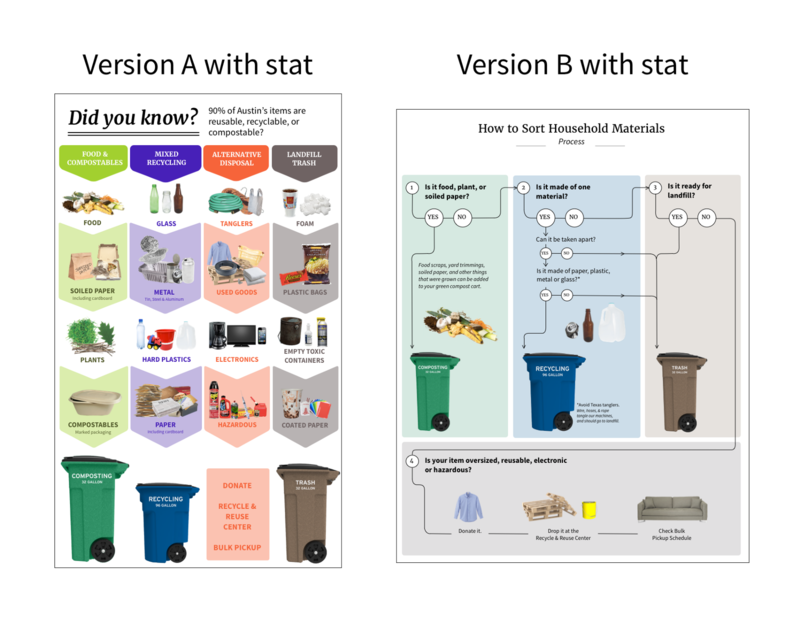 We developed two sorting guides to test whether new knowledge would impact their recycling accuracy and confidence. Sorting guide version A was a list of many common items and categories that a person can dispose of and where it goes. 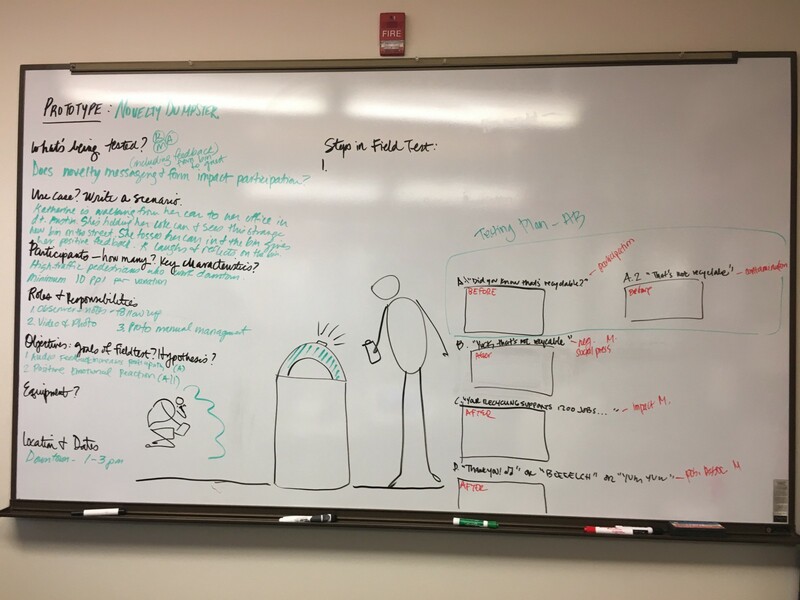 Version B was a decision flow, offering a set of steps to determining if an item is compostable, recyclable, or destined for the landfill. Take a quiz we created on google forms, choosing the best way to dispose of different items such as a pringles can and a coat hanger. Review one version of the sorting guide, providing unprompted feedback to the test moderators. Using the sorting guide, take the quiz again. Rate your level of confidence again. ‘Oh! Coated paper. Man, the recycling center is getting most of my coated paper & plastic bags.” –Britt remarked about coated paper & plastic bags not belonging in recycling. “What are these colored things?” –Sarah referring to one of the images that is too small to comprehend. “My confidence is waning…I learned recycling in a different area of the country so the rules were a little different, and I don’t think there were, at that time, as many options as you have.” –Dan shared how the list made him feel slightly overwhelmed. 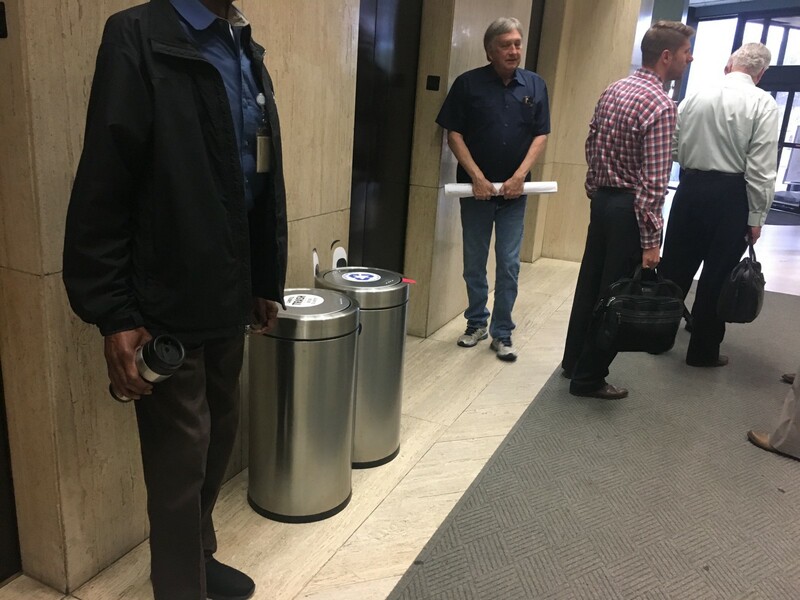 “What qualifies as ‘ready for landfill’…that’s a little vague.” –Nate remarked on the 3rd decision step. “This number seems higher than I though. I like that…most items are recyclable, reusable, [compostable].” –Matt reflected on the stat. In-person tests using the quiz convinced us that, if we were going to keep the process flow version, we would need to refine it. The list was much more effective in improving people’s accuracy and confidence. the list improved participant accuracy by 16%, and confidence by 16%. We decided the flow had some flaws so we decided to refine it and worked a second iteration into the plan for the next week. Rapid prototyping is a team sport. Our Austin Resource Recovery partners bring insights to the studio that strengthen the work and help us avoid potential barriers by identifying them early on. 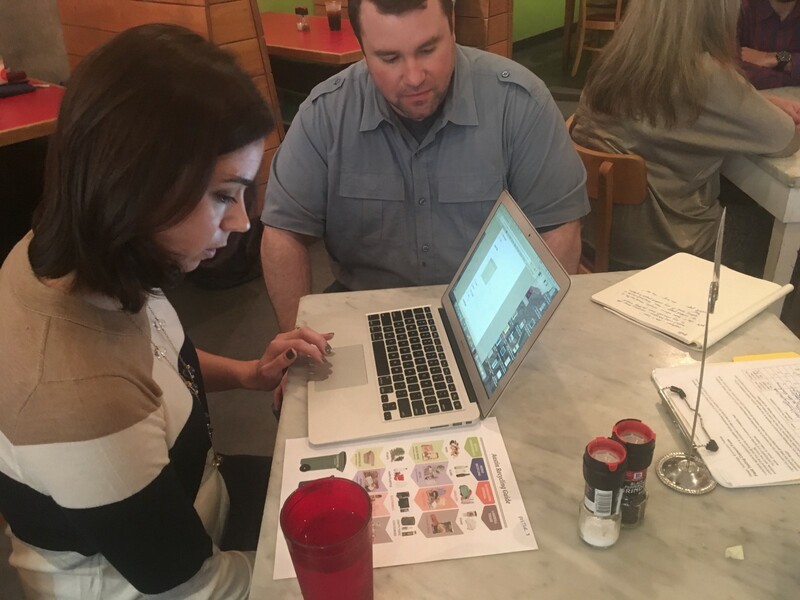 Melissa Heald, a public information specialist for Austin Resource Recovery, was instrumental in working through both prototypes above and proofing the content for accuracy. Having partners along for the ride also builds a stronger relationship between the fellows and our partner-client. We absorb as much of their expertise on waste management and as we can, and they practice the same rapid methods we use to take chances, fail fast, and create valuable products and services faster. Follow along for a report on our next round of prototyping by clicking the follow button above.